The Toxics in Fish Vital Sign establishes a broad recovery goal regarding toxic contaminants in Puget Sound stating that, fish populations will not be harmed by toxics contaminants and that they will be safe for consumption by predators and humans. 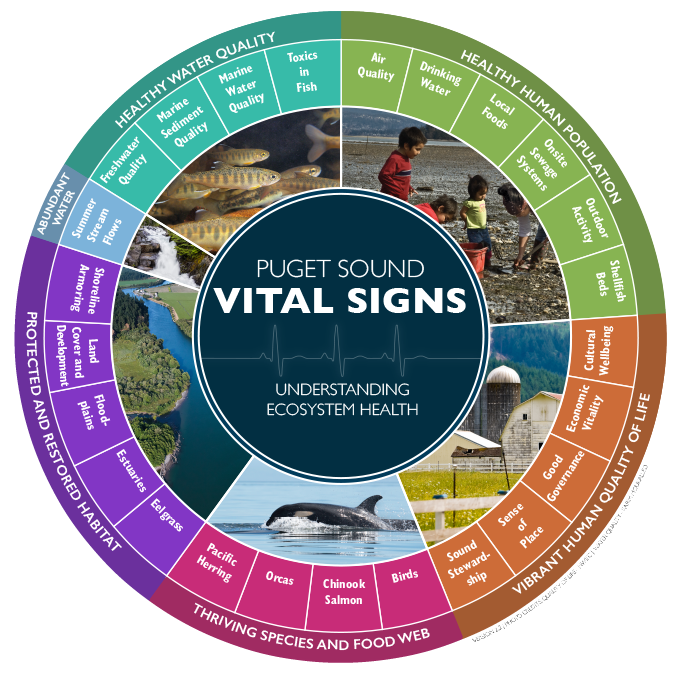 The Vital Sign includes specific recovery targets covering a suite of chemical classes (PCBs, PAHs, PBDEs, and EDCs) and fish species (salmonids, English Sole, and Pacific herring). The targets were established based on fish-health or consumption threshold values allowing the comparison of measured contaminating concentrations in fish with the threshold levels to determine whether the fish (or the predators that consume them) would potentially be harmed by the contaminants, and if they are safe to eat. Implementation Strategies are recovery plans aimed at meeting specific Vital Sign targets. They provide a roadmap for achieving the Vital Sign targets and serve as a fundamental part of the adaptive management framework for the Puget Sound. Each Implementation Strategy provides a situation analysis, focusing mainly on the causes and contributing factors to a particular problem and identifies broad strategies and specific actions which are thought to most likely lead to ecosystem recovery. The strategy and actions can serve as funding guidelines to federal, state, and local agencies for project and program implementation. A Toxics in Fish Implementation Strategy is currently being developed under a project funded by the EPA National Estuary Program. Experts from a broad range of groups (university research, environmental monitoring, regulatory, regulated, and NGO) have been called together to help identify priority causes and solutions to Toxics in Fish. They have used a wide array of toxics monitoring provided by the WDFW TBiOS program, Ecology’s sediment monitoring program, and other regional monitoring combined with relevant scientific literature to focus on causes and solutions. Although still under development, the broad recommendations include identifying and accelerating the clean-up of contaminated sites, removing the sources of contaminants, prioritizing contaminants of emerging concern based on risk to species, and regulatory reform. The Toxics in Fish Implementation Strategy will be completed in 2019 and subsequently be used as a funding guide thereafter. --Source: PSEMP Toxics Work Group (2019). 2018 Salish Sea Toxics Monitoring Synthesis: A Selection of Research. C.A. James, R. Jordan, M. Langness, J. Lanksbury, D. Lester, S. O’Neill, K. Song, and C. Sullivan eds. Puget Sound Ecosystem Monitoring Program. Tacoma, WA. 88 pgs. Read more about the Puget Sound Implementation Strategies. Linda Bentley1 , C. Andrew James2: 1. Washington State Department of Commerce; 2. UW Tacoma Puget Sound Institute.